... which culminated with what may be capitulatory buying last Friday, when the Dow soared 444 points due to the Street’s positive reaction to the so-called progress of the Sino-US trade talks and the large-scale liquidity injection in January by Chinese authorities. 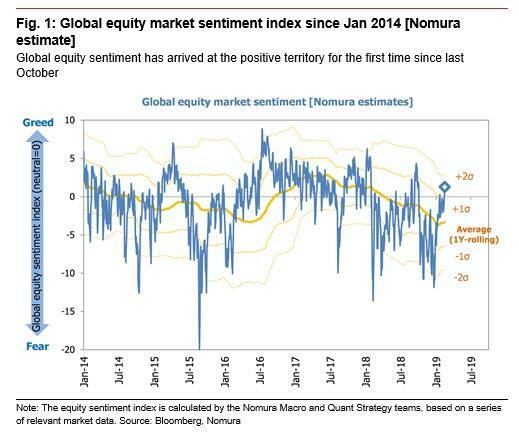 At the same time, Nomura’s gauge of equity market sentiment in US and global markets has returned to positive territory for the first time since last October. 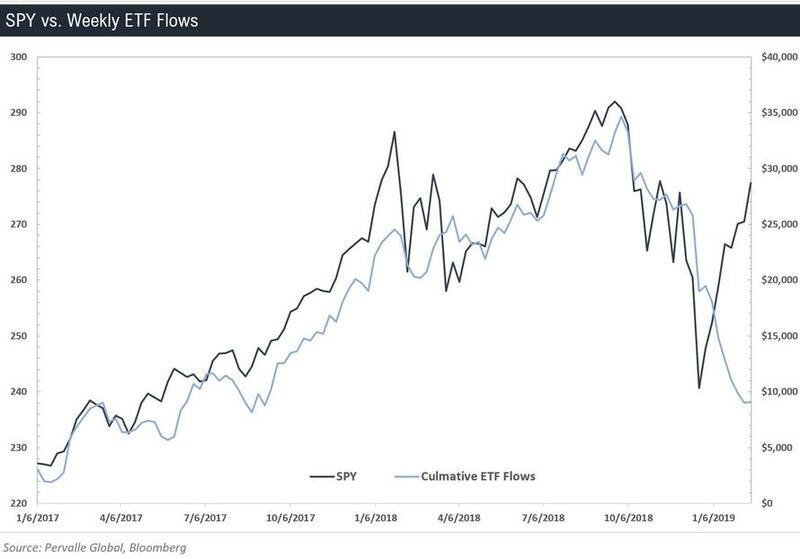 Since some investors, whose scope is not only short-term but also medium- and long-term, may be aware of the potential risk of NOT holding US equities, it seems a “panic buying” mood, with purchases by investors who had been lagging the broader market, has accelerated according to Nomura . Yet even though the US equity market is expected to edge higher in the short-run with the help of some buying inertia - which is basically Marko Kolanovic's entire (latest) bullish thesis, Nomura warns that "a sense of overheating in the markets’ upward momentum is rising at the same time and thus a cooling-off phase is likely forthcoming." Specifically, according to Nomura's quant team, based on past behavior of systematic trend following algos, the Japanese bank expects CTAs to preventatively take profits on long positions sporadically starting around 26 February. In addition, looking at technicals-based historical price patterns when the S&P500 breaches above its 200-day simple moving average (SMA) while its 20-day SMA is below 200-day SMA as in the present case – suggest a similar conclusion where S&P500 is likely to make shallow dips before heading higher. Of course, since in this "market", where only central planning and central bankers matter, predicting what actually happens next - and being accountable for one's forecast - is the fastest way to getting a pink slip, Nomura was quick to hedge, adding that considering the resilience of current market sentiment and the market-friendly stance of Fed and the Chinese authorities, "the next price correction of S&P500 will likely be healthy and not a very severe one." Nomura's conclusion: a drop may be coming, but don't forget to BTFD, to wit: "We believe as a short-term trading strategy of buying on dips from end-February to beginning-March targeting a subsequent return-reversal is attractive. In the past, S&P500 has experienced a long-lasting rising trend after the 20-SMA exceeded 200-SMA"